Iceland has been forcing itself on our consciousness in recent years, culminating recently in the humiliation of the English football team. There may be another unpleasant surprise up Iceland’s sleeve. Since 2010 there have been three volcanic eruptions in Iceland that have caused concern in two cases and consternation and alarm in the other. The 2010 southward dispersal of ash from the explosive phase of the Eyjafjallajokull eruption caused the panicked shutdown of half of Europe’s airports for six days. This eruption was unusual in that it lasted quite a long time – 39 days, and produced ash, some of which was transported south to Europe. At the end of July 2016 the Icelandic Met Office issued a statement noting increased earthquake activity at Katla volcano, the neighbouring, larger, “double” of Eyjafjallajokull. This is not that unusual, but is nevertheless a concern. Katla (meaning kettle or cauldron in Icelandic) has been one of Iceland’s most active volcanoes (20 eruptions in the last 1100 years), capable of eruptions that dwarf those of its neighbour. The last eruption was in 1918 and produced five times more ash than Eyjafjallajokull in 2010. 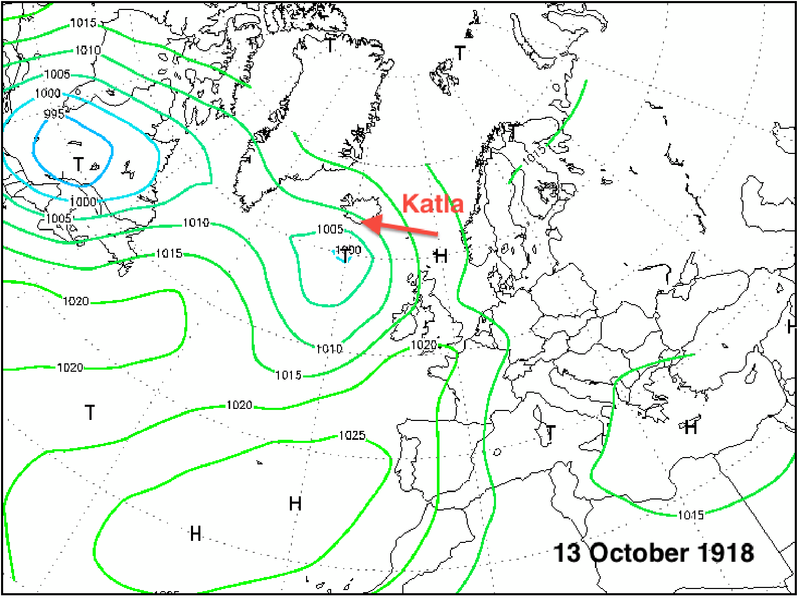 The next eruption of Katla will almost certainly start with a swarm of earthquakes merging to a tremor signal. Such an eruption today could cause widespread disruption to aircraft, but what is the likelihood? There is a chain of contingent factors at play. Firstly, what is the likelihood of a Katla eruption in the near future? Ten years ago this was modelled probabilistically at 20% in the next 10 years. Secondly, what magnitude and type of eruption will it be? The larger the magma mass flux, the higher the eruption column and the further the likely transport distance. Katla (like Eyjafjallajokull) has both low viscosity, basaltic magma (common, 93%) and high viscosity, silicic (dacitic) magma (rarer, 7%). The 1918 eruption was a basaltic eruption. Also the way in which these liquids are converted into fine fragments (<50 microns) in the eruption column and are advected 1000 km or more as “ash clouds” depends on the dynamics of the magma’s interaction with several hundred metres of overlying icecap, and is difficult to predict. The third main factor is the weather. As you can see from the deposition axes of past eruptions more northerly directions are favoured by the silicic ash plumes (Figure 1a), but there have been plenty of basaltic plumes heading south to Europe from Katla (Figure 1b). The pressure chart on the first days of the 1918 eruption is shown in Figure 2. These deposition patterns are created by the proximal fallout of larger fragments from the plume, the far-travelled fraction often having more complex trajectories. The longevity of explosive lofting of ash is important here, as the conditions for southerly transport will eventually occur. Figure 1 (a) – Axes of the deposition of basaltic ash (tephra) from eruptions of Katla over the past 1100 years. Arrows proportional to the volume of ash. Figure 1 (b) – As in (1a) but for silicic ash deposits from Katla between 10,200 BCE and 400 CE. Figures from Futurevolc’s Catalogue of Icelandic Volcanoes (futurevolc.vedur.is). Since 2010 our ability to respond to a potential Katla eruption in a less panicked manner has improved. The UK Civil Aviation Authority relaxed the “any ash-no fly” tolerance of planes to volcanic ash, by defining low (<2 mg m-3 of ash), medium (2 -4 mg m-3) and high (>4 mg m-3) ash zones to manage flight safety. Also the Icelandic scientific community is well primed to respond (futurevolc.vedur.is). This entry was posted in aviation, Climate, Environmental hazards, Volcanoes and tagged Iceland, Katla, Volcanoes. Bookmark the permalink.